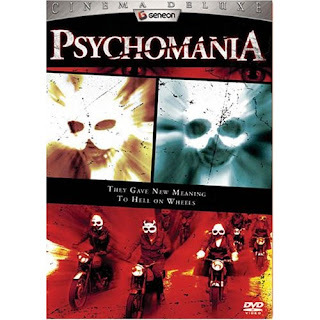 PSYCHOMANIA(1971), directed by Don Sharp. I was a bit skeptical about this movie at first, but it exceeded my expectations. Basically it is about a violent motorcycle gang called "The Living Dead" that wreaks terror and havoc on their city. The gang leader's mother is heavily into the occult and she has found the secret to immortality. The object of her worship is rather strange indeed...a frog! So anyway, her son discovers her secret and sets out to use it for his own nefarious ways...you see, if you kill yourself and you want to come back badly enough , you will! So......the gang leader drives his bike off a bridge and he's dead........they bury him with his bike....but later that day he arises from the dead and rides his bike out of his grave! Soon, one after the other, each of "The Living Dead"commit suicide so they can live forever.....some come back, some don't. Being undead has no disadvantages. You keep your youthful appearance forever and nothing can hurt you. This makes the gang much more violent and dangerous....they are murdering way too many people just for kicks! Although low-budget, this movie is well made. The cinematography is atmospheric with a creepy vibe, the acting is good, and it is generally pleasing to the eye. The soundtrack is good as well: a sinister groove with a wah-wah pedal pervades the movie throughout.